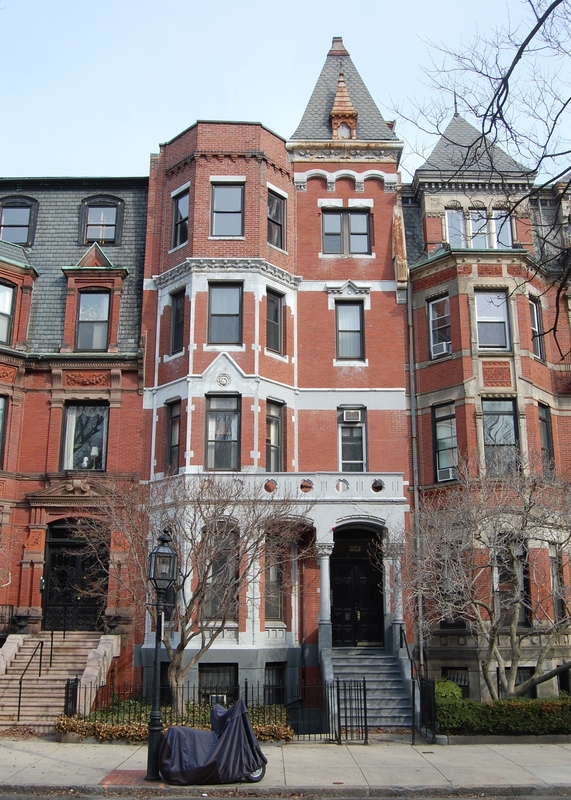 323 Commonwealth is located on the north side of Commonwealth, between Hereford and Massachusetts Avenue, with 321 Commonwealth to the east and 325 Commonwealth to the west. 323 Commonwealth was designed by Kirby and Lewis. architects, and built in 1879-1880, one of three contiguous houses built by building contractor Asa Harden Caton for speculative sale on land owned by wallpaper merchant Charles Henry Hayden. 319 Commonwealth was built first and completed in 1879; 321-323 Commonwealth were completed in 1880. Charles Hayden purchased the land for 319-321-323 Commonwealth on July 1, 1878, from Grenville T. W. Braman, Henry D. Hyde, and Henry M. Whitney, trustees of a real estate investment trust that had purchased several parcels of land on March 1, 1872, from the Boston Water Power Company. 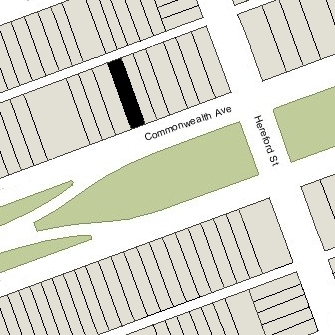 Click here for an index to the deeds for 323 Commonwealth, and click here for further information on the land on the north side of Commonwealth between Hereford and Massachusetts Avenue. The original building permit applications for 319 and 321 Commonwealth have not been located. The original permit application for 323 Commonwealth, dated March 26, 1879 (and indicating that it is for “1 in a block of 2” houses) shows Asa Caton as the owner and the builder. Probably based on this permit application, Bainbridge Bunting’s Houses of Boston’s Back Bay indicates that Asa Caton was the original owner of all three houses. In fact, however, Charles Hayden owned the land and appears to have entered into an agreement with Asa Caton to build the houses on it. When 319 Commonwealth was completed, Charles Hayden sold the house and land to Andrew Wheelwright. When 321-323 Commonwealth were completed, Charles Hayden sold them to Asa Caton, who then resold each property on the same day he acquired it, probably thereby recovering his costs for purchasing the land from Charles Hayden and building the houses, plus a profit. The final building inspection report for 321 Commonwealth, dated October 5, 1880, shows Asa Caton as both the owner and builder (the inspection reports for 319 and 323 Commonwealth have not been located). Bunting does not attribute 319-321-323 Commonwealth to a specific architect, and no architect is named on the permit application for 323 Commonwealth, nor on the final inspection report for 321 Commonwealth. 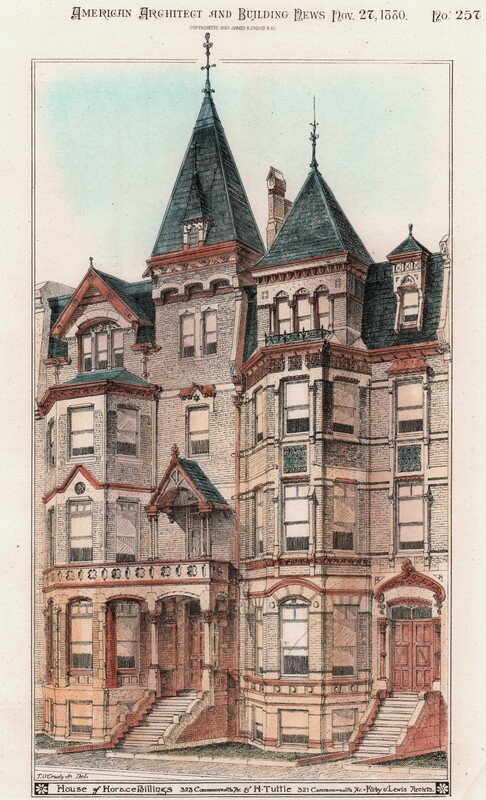 However, a drawing of 319 Commonwealth (without the address given) appeared in the November 23, 1878, edition of the American Architect and Building News, indicating that it was designed by Kirby and Lewis. It appears likely that they designed 321-323 Commonwealth as well. In 1880, Asa Caton built three additional houses on land owned by Charles Hayden at 337–339–341 Commonwealth. Bunting attributes all three of these houses to Kirby and Lewis. Bunting does not attribute 319-321-323 Commonwealth to a specific architect, and no architect is named on the permit application for 323 Commonwealth, nor on the final inspection report for 321 Commonwealth. However, a drawing of 319 Commonwealth (without the address given) in the November 23, 1878, edition of the American Architect and Building News, indicates that it was designed by Kirby and Lewis, and a drawing of 321-323 Commonwealth in the November 27, 1880, edition of the American Architect and Building News indicates that they, too, were designed by Kirby and Lewis. In 1880, Asa Caton built three additional houses on land owned by Charles Hayden at 337–339–341 Commonwealth. Bunting attributes all three of these houses to Kirby and Lewis. On January 1, 1880, Asa Caton purchased 323 Commonwealth from Charles Hayden, and on the same day he sold it to hide and leather merchant Horace Billings. He and his wife, Sarah Arianna (Sears) Billings, made it their home. They previously had lived at 812 Tremont. Sarah Billings died in July of 1880 and Ellen Sprague died in December of 1880. Charles Sprague moved soon thereafter to live with his widowed father, Charles James Sprague, at 380 Marlborough. Horace Billings continued to live at 323 Commonwealth. By 1882, he had been joined there by his adopted daughter, Elizabeth G. Billings. In April of 1882, they both applied for passports to travel abroad. On November 14, 1888, he transferred 323 Commonwealth to Elizabeth G. Billings. They continued to live there during the 1888-1889 winter season, after which they moved to 53 Hereford. On September 9, 1889, 323 Commonwealth was purchased from Elizabeth Billings by Sarah Augusta (Kenison) French, the wife of retired distiller William E. French. Their unmarried sons, Charles Edward French and George Baldwin French, who had succeeded to their father’s distillery business, lived with them. They all previously had lived at 47 Chester Square. The Frenches’ son-in-law and daughter, Frank R. Thomas and Adelaide A. (French) Read Thomas, lived at 313 Beacon, which was owned by William French. William French died in January of 1890 and Sarah French died in August of 1895. 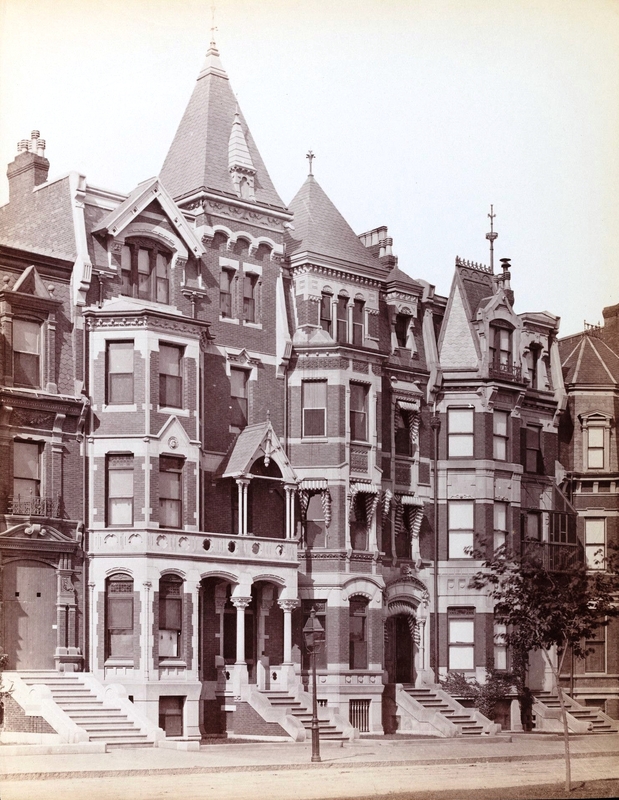 Their home at 323 Commonwealth and the Thomases’ home at 313 Beacon were inherited by their three surviving children: Adelaide (French) Read Thomas, Charles French, and George French. 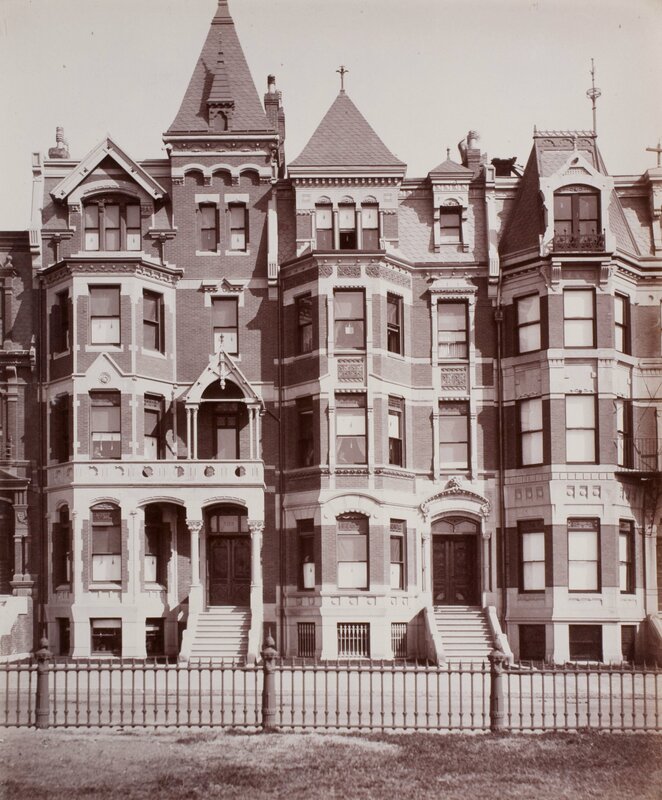 Charles and George French continued to live at 323 Commonwealth and on November 3, 1903, Adelaide Thomas released her interest in that property to them and they released their interest in 313 Beacon to her. Charles French died in August of 1904. In his will, he left his interest in 323 Commonwealth to his brother. 321-323 Commonwealth (ca. 1883), photograph by Albert Levy; Ryerson and Burnham Libraries Book Collection, The Art Institute of Chicago (Digital file #000000_100709-14). George French continued to live at 323 Commonwealth. By the 1904-1905 winter season, Frank and Adelaide Thomas had moved from 313 Beacon to live with him. Frank Thomas was a salesman for a wholesale grocery company. Frank Thomas died in September of 1927 and Adelaide Thomas died in May of 1928. George French continued to live at 323 Commonwealth until his death in February of 1934. 323 Commonwealth was not listed in the 1935-1937 Blue Books and was shown as vacant in the 1935-1937 City Directories. On February 2, 1937, 323 Commonwealth was purchased from George French’s estate by real estate dealer Henry Joseph O’Meara, and on April 15, 1937, it was acquired from him by Virginia Lee (Major) de Roode, the wife of Albert de Roode, Jr., an insurance underwriter. Albert and Virginia de Roode lived at 114 Bay State Road with her step-father and her mother, Dr. Clarence Field Worthen and Julia Palestine (Yates) Major Worthen. Clarence Worthen was a physician and oculist; he maintained his office at 390 Commonwealth. In July of 1937, Julia Worthen (shown as Julia De Roja on the permit application) filed for (and subsequently received) permission to convert 323 Commonwealth from a single-family dwelling into ten apartments. After the work was completed, the Worthens and the de Roodes moved to apartments at 323 Commonwealth. Albert and Virginia de Roode moved soon thereafter and were living in Buckhead, Georgia, at the time of the 1940 US Census. Clarence and Julia Worthen divorced in about 1940; he moved to 390 Commonwealth and she continued to live at 323 Commonwealth. In 1942, Julia (Yates) Major Worthen married again, to John J. O’Carroll. After their marriage, they lived at 323 Commonwealth. By the mid-1940s, they were joined by Virginia de Roode, who had divorced from Albert de Roode. She married again in December of 1946 to Donald Hill Farrington. After their marriage, they lived in an apartment at 62 Commonwealth. On June 18, 1947, Virginia Farrington transferred 323 Commonwealth to her mother, Julia O’Carroll, as trustee for her own benefit during her lifetime, with the principal to be distributed to Virginia Farrington upon Julia O’Carroll’s death. The O’Carrolls continued to live at 323 Commonwealth until about 1950. On August 27, 1962, 323 Commonwealth was acquired from Julia O’Carroll by Lester J. Robinson. He and his wife, Edith M. (Cronshaw) Robinson, lived in Lowell. On April 9, 1964, he transferred the properties to their daughter, Louise Edith Robinson, as trustee of the Louise Robinson Realty Trust. On May 28, 1964, 323 Commonwealth was acquired from Louise Robinson by Donald Boyko and Arthur J. Boyko, trustees of the Boyko Real Estate Trust. 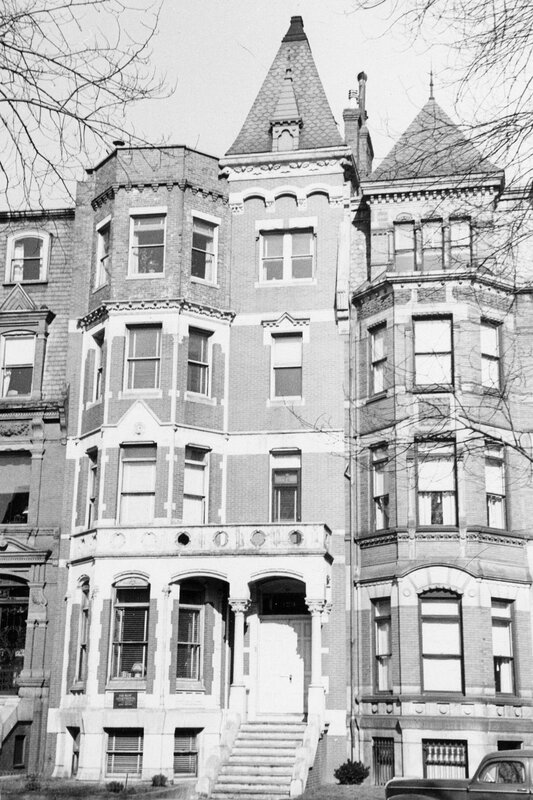 On January 19, 1984., Donald Boyko converted the property into ten condominium units, the 323 Commonwealth Avenue Condominium.